Anyone who eats a restricted diet—whether by choice or for health reasons—has their own story. I have mine, you may have one, and Debbie Adler, author of Sweet Debbie’s Organic Treats, has hers. 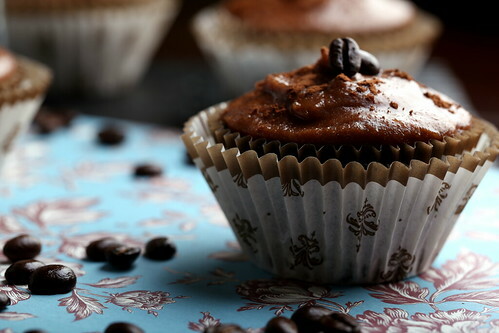 A former CPA for a large accounting firm in New York City, Debbie opened her own Los Angeles bakery, Sweet Debbie’s Organic Cupcakes, in 2006 and became wildly successful by creating her own desserts using only organic ingredients and all-natural sweeteners. And when she found out that her son had multiple life-threatening food allergies to common foods like dairy, casein, eggs, wheat and nuts a couple of years later, she began to exclusively develop completely allergen-free treats for her son that were not only safe and healthy, but also delicious and indulgent. Because Debbie’s creations were so successful and filled a growing need in the allergen-free community, her business continued to thrive, transforming her hard-earned efforts into something truly sweet. Even though I have no food allergies or intolerance of my own, I still think it’s important to learn how completely clean ingredients work, as I know several people who have mild to severe allergies to things like nuts and soy, have celiac disease, gluten intolerance and/or diabetes. So when the kind folks over at PR by the Book sent me a copy of Debbie’s book to review, I thought it would be a good opportunity to roll up my sleeves and learn more about allergen-free ingredients and techniques. Packed with 50 mostly sweet, but some savory baked items, Sweet Debbie’s Organic Treats boasts a wide array of allergen-free recipes like red velvet cupcakes, salted caramel apple muffins, Sicilian Mandel bread and basil lemonade cookies. All of her recipes utilize the same all-purpose gluten-free flour mix base, which contains a blend of tapioca, sorghum, millet, teff, and quinoa flours and can be found in the opening pages of her book.I made Debbie’s Mocha Italian Espresso Cupcakes, discovering erythritol and coconut nectar (both new-to-me ingredients) along the way, which are used in the frosting portion of these cupcakes. Erythritol has the appearance of finely-ground sugar, but has a zero glycemic index and is all natural (derived from plants). Once it hits the tongue, it imparts a mildly sweet and slightly cooling sensation. And although I use lots of coconut vinegar in my recipes, I have never heard of coconut nectar, which is a very sweet and sticky syrup that I found has a nice binding ability and is also minimally processed and nutrient dense. Making and eating this dessert was an entirely new experience for me in approach, prep and taste—and I look forward to trying more using these ingredients. Because I loved making and eating these cupcakes, I am excited that PR by the Book has not only allowed me to share Debbie’s recipe here, but is also offering a free copy of Sweet Debbie’s Organic Treats through this blog post! To enter the giveaway for a chance to win, just leave in the comments section your favorite vegan, organic or allergen-free baking ingredient, including your email or some way to contact you in case your comment is drawn, and I’ll announce the winner at random on January 19 (shipping is restricted to the US only) … good luck! Winner of this giveaway is Michelle, thanks to everyone who entered! Recipe from Sweet Debbie’s Organic Treats: Allergy-Free & Vegan Recipes from the Famous Los Angeles Bakery by Debbie Adler. Reprinted courtesy of Harlequin. Preheat oven to 325. Line a standard 12-cup cupcake tin with paper baking cups. 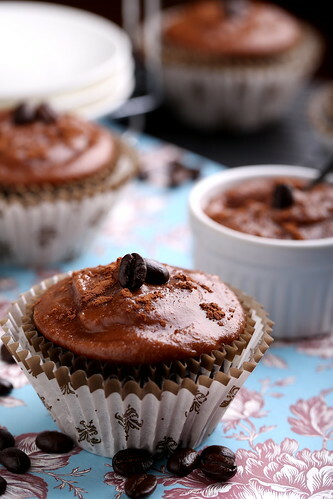 To make the cupcakes, mix together the rice milk, coffee and apple cider vinegar in a 2-cup measuring cup. 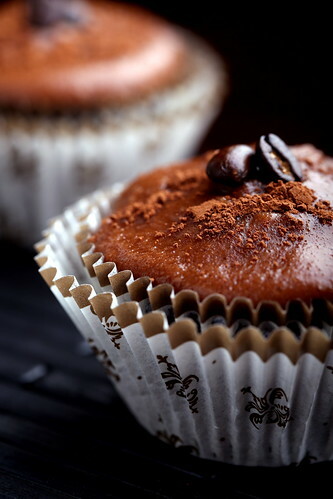 Whisk together the flour, espresso powder, cacao powder, baking powder, baking soda, guar gum and salt in a large bowl. Make a well in the middle. Add the grapeseed oil, coconut nectar, vanilla and stevia to the flour mixture and stir to combine. Next add the rice milk–coffee mixture and stir until it is absorbed and the batter is smooth. Stir in the yogurt until well combined. Pour the batter into the prepared cupcake tin, dividing it evenly. Each cup should be about two-thirds full. Bake the cupcakes for 16 to 17 minutes, or until they bounce back slightly to the touch. Rotate the cupcake tin from front to back after 10 minutes of baking. 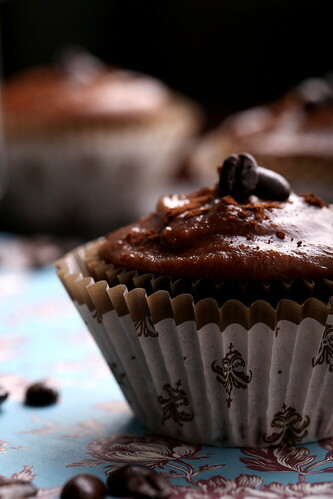 To make the espresso frosting, mix together the coconut oil and coconut nectar in a medium-size bowl. Add the powdered erythritol, hot water, espresso powder and salt and stir until smooth and well combined. Spelt flour is one of my go-to baking ingredients! For gluten-free baking, oat flour and brown rice flour. Thanks for offering the giveaway! My favourite baking ingredient is Bob's Red Mill All-Purpose GF Flour because I don't have the patience to mix and match bits of this with bits of that! i love avocado. yummy and healthy! I enjoy using the leftover pulp from making almond milk for baking. I store it in the freezer to keep it fresh or I dehydrate it and grind it into fine almond flour. I still think that flax seeds are an amazing (and unlikely-looking) substitute for eggs in baking. I would be very disappointed if I could never eat cookies again! I'm allergic to eggs, so Ener-G and flax seeds are both staples at my house. I haven't tried the Vegg yet but I've heard good things about it. I love brown rice syrup! I love flax seeds…perfect egg sub in baking and packed with nutrients! My wife and I love baking with over-ripe bananas. Mmmmmmmmm……. I love using flax seeds. Garbonzo beans! I make some incredible chocolate chip blondies and the main ingredient is garbonzo beans and they are simply phenomenal. I make a 8×8 pan and it is literally gone in about 30 minutes – guess I should be doubling the recipe and making a bigger batch! I love it when people rave about how good they are and I tell them what the "secret" ingredient is – they are blown away! I always said I could never be vegan as long as there is butter, but then I discovered coconut oil. I love arrowroot in place of cornstarch or flour. Bob's Red Mill All-Purpose GF Flour!! Great stuff! I love flax seeds, don't know what I ever did before they were part of my life! My favorite vegan/GF ingredient is Grade B Maple Syrup! It's healthier than sugar/agave, has a wonderful rich flavor, and is incredibly versatile! I like baking with silken tofu, mashed beans, and flax "eggs". Flax and chia seeds are a new favorite! My personal favs are chia seeds and coconut oil! And I love using maple syrup as a sweetener! I use flax all the time! I also have also been using Stevia really frequently. Lets Do Organic brand Creamed Coconut! It's a thickening agent awesome for baking and soups. Plus totally ok for allergens and my ACD diet. My favorite is flax eggs to covert traditional recipes and also subbing in almond flour for all purpose to add some fiber. i love coconut oil, never heard of coconut vinegar before! wondering if fried jack fruit in smoke could be a vegan bacon substitute! Right now, my favorite has to be sunflower seeds. I'm broke, so I use them instead of cashews in cashew cream. Also people with nut allergies can usually eat sunflower seeds. I also like oat flour for making cookies you'd never know were gluten free.